third party of any kind. 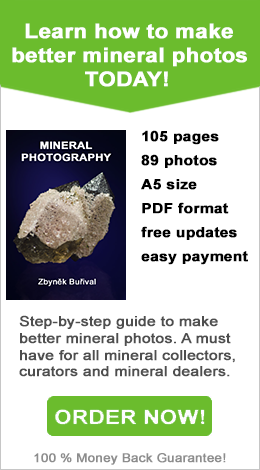 1) Advertisers using PhotographingMinerals.com may save cookie files on visitors hard disk. 2) Cookie files can be deleted any time and accepting cookies can be turned off in your browser. in mind that the site owner will NOT be paid for advertisement when you turn cookies off. 1) Name, e-mail, address and other information about customers is strictly private. These information will NEVER be published, shared or sold to any other person or business. 2) Customers will receive free updates of purchased e-book via their e-mail. 3) Customers will receive newsletter with updates or interesting information irregularly. Customers can unsubscribe to the newsletter any time. It will not affect e-book updated.